Percutaneous insertion was technically successful with satisfactory balloon placement in all five animals. The mean operative time required for balloon insertion was 52 ± 6 minutes, and there were no complications (Table 2). aSeven tissue biopsies were obtained from the five animals at the time of augmentation ureterocystoplasty for cytokine assay. All five animals underwent successful ureteral expansion over a mean of 25 ± 1.4 days (Table 3). The mean final volume of the ureter was 177.1 ± 41.3 mL. The mean volume of fluid instilled was 12.7 ± 0.9 mL in the first week, 38.4 ± 4.3 mL in the second week, 66.2 ± 17.4 mL in the third week, and 59.8 ± 28.4 mL in the fourth week. The mean daily inflation volume was 1.8 ± 0.1 mL in the first week, 5.5 ± 0.6 mL in the second week, 11.3 ± 2.5 mL in the third week, and 16.1 ± 1.8 mL in the fourth week. All five awake animals readily tolerated the daily incremental instillation of dilute contrast solution without apparent pain or discomfort. The inflation could be carried out without anesthesia or analgesia while the overnight fasting animal was busily eating. Radiologic volumetric assessment of the ureteral balloon during the phase of ureteral expansion was commensurate with the amount of fluid instilled. We did not note any complications during ureteral expansion. Proximal urinary drainage through the fen-estrated channel of the ureteral expansion catheter was adequate in all five animals. aTotal volume of fluid introduced into balloon in a week divided by number of days injected. Although inflation was performed daily, a few days were skipped for logistical reasons. bTotal volume of expansion achieved during week. cEstimated amount of fluid in balloon at end of expansion process. dActual volume of fluid aspirated from ureteral expansion balloon immediately prior to augmentation ureterocystoplasty.This volume was slightly less than the anticipated volume. There are two possible explanations: (1) some immeasurable fluid loss may occur during balloon inflation because of sudden movement of the animal, and (2) some fluid may not be completely aspirated from balloon. watertight anastomosis in all five cases. Postoperative complications were seen in two animals: lower ureteral obstruction and pyelonephritis with urosepsis. Over a follow-up ranging from 15 days to 3 months, the mean bladder capacity was 574 ± 221.3 mL (range 380-940 mL). The Pves at maximum capacity was 14 ± 4.5 cmH2O (range 8-20 cm^O), and bladder compliance was 71.7mL/cmH2O (range 35.3-188 mL/cm^O). Uninhibited detrusor contractions were not evident on urodynamic evaluation in any of the five animals (Table 4). Cystography revealed ipsilateral reflux in four renal units: grade II in one animal, grade IV in two animals, and grade V in one animal (Fig. 7). At autopsy, one renal unit demonstrated lower-ureteral obstruction and therefore showed no reflux on cystography. There was no contralateral reflux in any renal unit. In all four refluxing units, the refluxed contrast drained from the kidney immediately after the bladder was emptied, thereby ruling out any ureteral obstruction. Additionally, the cystogram did not reveal contrast extravasation in any case. Cystoscopy was performed in all animals at one month and at autopsy. By one month, the bladder revealed a fully regenerated mucosa in four animals; one animal euthanized at 15 days still had patchy areas of denuded mucosa. aCystographic examination was performed at one month (N = 3) and at autopsy (N = 5) by injecting contrast through a urethral catheter. In all refluxing renal units, obstruction was ruled out by documentation of prompt drainage of contrast from the collecting system. bUrodynamics, in the form of filling cystometrogram, was performed in each animal immediately prior to autopsy.The animal was anesthetized and placed supine on the table.The bladder was filled through a 6F urethral catheter, and intravesical pressure was recorded through a separate 6F urethral catheter connected to manometer tubing. Parameters recorded included total bladder capacity, resting and end filling pressures, bladder compliance, and involuntary detrusor contractions. cNo animal developed contralateral reflux. FIGURE 7 ■ Autopsy photographs. 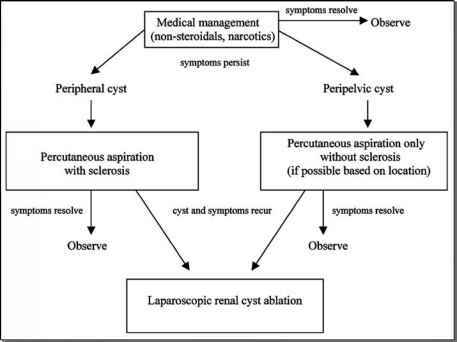 (A) Augmented bladder and both renal units. Healed suture line between expanded ureteral patch (u) and native bladder (b) is seen (arrows). (B) Interior of augmented bladder shows demarcation (arrows) between expanded ureter (u) and native bladder (b). Notice complete epithelization of expanded ureteral patch. Histologic examination of the expanded ureter harvested at the time of autopsy revealed persistent muscle hypertrophy and hyperplasia, a fully regenerated transitional epithelium, and variable amount of fibrosis. hyponatremia, hyperkalemia, and acidosis (Table 5). The mean serum creatinine concentration was 1.3 ± 0.2 mg/dL at baseline, 0.9 ± 0.2 mg/dL at bladder augmentation, and 2.0 ± 0.9 mg/dL at euthanasia. At autopsy, the ureteral patch appeared well vascularized, and the ureterocystoplasty suture line was healed in all five animals. The ipsilateral renal parenchyma appeared grossly normal in three cases, with pre-euthanasia intravenous urography revealing prompt opacification with mild hydronephrosis. One animal with a lower ureteral obstruction revealed thinning of parenchyma and poor function on intravenous urography. At autopsy, the obstruction was found to be the result of flimsy synechia formation at the junction where the upper, normal caliber ureter entered the expanded ureteral segment. The animal with pyelonephritis and urosepsis had a grossly scarred kidney that was nonfunctioning on intravenous urography. Light microscopic examination of biopsies of the expanded ureter obtained at the time of augmentation cystoplasty revealed muscle hypertrophy and hyperplasia, mucosal atrophy, and variable inflammatory infiltrate. Transmission electron microscopy performed on the ureteral tissue obtained at the time of laparoscopic augmentation revealed cellular evidence consistent with muscular hypertrophy and hyperplasia. 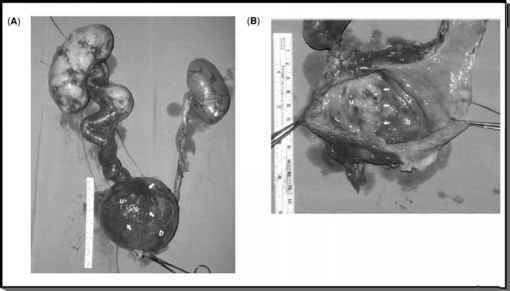 After percutaneous placement of the balloon device, in-line expansion of the distal ureter was achieved on an outpatient basis over 23-38 days to a volume of upto 218 mL. Notably, all three patients did not require any analgesia during this entire expansion process. The availability of a urothelium-lined, muscle-backed, vascularized, autogenous, in-line tissue material for purposes of augmentation, and possibly even replacement, of the urinary bladder would indeed be a major advance. The ureter, with its transitional epithelium, is potentially an optimal tissue for bladder augmentation. Preliminary data on growth factor expression in expanded ureteral tissue obtained and snap frozen at the time of augmentation ureterocystoplasty revealed a two to threefold increase in transforming growth factor-P2 (median, 44 pg/mL; range, 27-49 pg/mL) over controls (normal ureter, 16 pg/mL). There was no increase in vascular endothelial growth factor expression in the expanded ureteral tissue compared with control samples.